Shiitake Dried Sliced Mushrooms from Eden foods contain all of the benefits of conventional mushrooms and more. The mushrooms used to make Shiitake Dried Sliced Mushrooms are hand harvested by Eden Foods from the shii trees of central and southern Japan. Mushrooms are the only vegetable source of vitamin D --a deficiency in vitamin D can lead to bone density loss and increased risk of serious conditions such as certain cardiovascular disease and s.
If you're looking for a quick snack or even a new, delicious pizza topping, try Shiitake Dried Sliced Mushrooms from Eden Foods. Available at a great low price from eVitamins today! Recommended Use: Soak the mushrooms in warm water, covering for five to seven minutes to reconstitute before using. 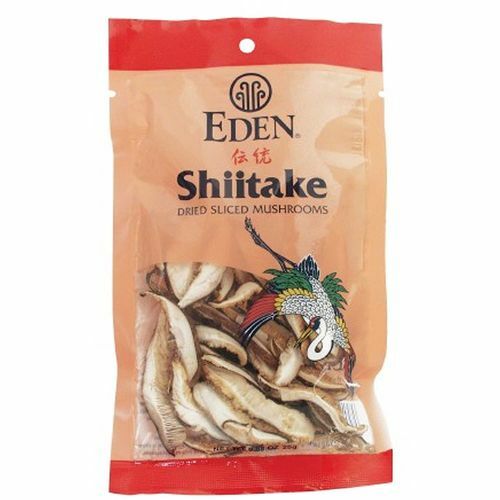 The customer reviews posted below are based on individual consumer experiences and may NOT necessarily represent what expected results will be from using or taking Eden Foods Shiitake Mushrooms - Dried Sliced - 0.88 oz. These results may not be typical and you should not necessarily expect to receive the same results. Actual results may vary. They are so easy to use and good for you.